Pictured atop from left: Sheryl, Jennifer, Wendy and Debbie Yuengling, sixth-generation decedents of David Gottlieb Jüngling, the founder of D. G. Yuengling & Son in 1829. Jennifer is VP of operations at Yuengling, while Wendy is chief administrative officer. Jennifer and Sheryl work in production and shipping. Yuengling occupies a peculiar space in the beer world. Technically considered America’s largest craft brewery by the Brewer’s Association, Yuengling competes on domestic and domestic-premium levels within its 22-state footprint. The company produces 2.8 million barrels of beer annually. Its flagship is the light, sessionable Traditional Lager. 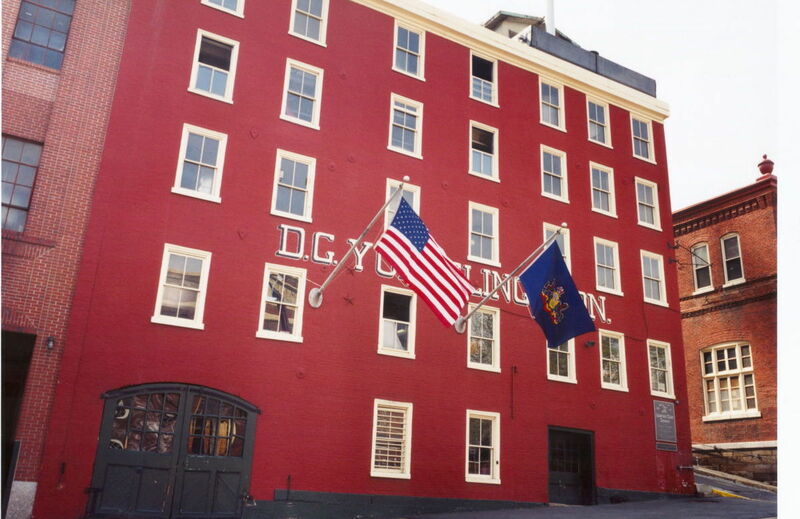 Whether craft or not, Yuengling remains America’s oldest family-owned brewery. Founded in 1829 in Pottsville, Pennsylvania, the company continues to innovate. This month Yuengling launched its first new year-round beer in 17 years: Yuengling Golden Pilsner. We recently spoke with sisters Wendy and Jennifer Yuengling, brewery executives and sixth-generation descendants of the company’s founder, about their new brew and the American beer market. Kyle Swartz: What are current trends you see in American beer? Jennifer Yuengling: I personally feel that the trend towards hoppier beers is slowing down. Our intention with Golden Pilsner was not to put out a beer that was hop-forward, but one that’s more balanced between hops and malt. Wendy Yuengling: We think the market’s trending more towards sessionable beers. That’s a big part of why we went with a beer like Golden Pilsner. KS: Are you concerned about the recent slowdown in the U.S. beer market? WY: We’ve been around for 189 years. We’ve weathered tough times before. We’ll continue to look at business opportunities, and how to get better. JY: We recently opened in two new markets, Indiana and Kentucky. We stay focused on gradual growth. We’re in it for the long-term. KS: Do you consider yourselves a craft brewery? JY: We consider ourselves more of a regional brewery because of our size. We try to keep our brands very affordable. We look at every consumer as a potential opportunity. We do make good craft-style beers, though. Golden Pilsner is a good example of that. WY: We also have our Lord Chesterfield Ale, Dark-Brewed Porter, Black & Tan, and seasonal Oktoberfest. JY: We’re America’s oldest family-owned brewery. That’s more important to us, and that’s what resonates with consumers. KS: Will you ever open a test kitchen brewery? JY: We don’t have a test kitchen yet, but it’s on our radar. We have ideas for more craft-style beers, but they remain in the infancy phases. For the past 18 months we’ve been primarily focused on Golden Pilsner. We want to make sure this beer has legs before we expand too much elsewhere. KS: So we probably won’t see you release a sour or a New England IPA? KS: Why have you launched Golden Pilsner? WY: From a marketing and sales standpoint, we believed that this was a style that we were not capturing. It’s a highly sessionable, malt-forward beer. It’s well balanced. JY: A pilsner like that is difficult to make because you can’t just throw in more hops to cover up mistakes. Yuengling Brewery in Pottsville, Pennsylvania. KS: You recently updated your product packaging. WY: That was a big initiative for us. Our packaging hadn’t changed in 20 years. This packaging mimics the hierarchy of our core brands. It’s brighter and classier. It sells to the consumer and helps tell them about the liquid within. KS: What’s the story behind the eagle on your branding? JY: When our great-great-great grandfather founded the brewery in 1829, it was called Eagle Brewery. That brewery burned down two years later, and when he rebuilt he renamed the brewery Yuengling. But we kept the eagle. KS: What does it mean to both of you to be part of the women’s movement in alcohol? JY: We honestly don’t get caught up in that. Our interest isn’t in regards to men or women, but doing the best we can. That’s what’s important. WY: We’re just trying to represent our family. KS: What’s the weirdest mispronunciation you’ve heard of your brand name? JY (laughing): Not so much a mispronunciation, but people always seem to think we’re a Chinese company.